Page Elements can be very useful tools in designing your pages by making your page creation much faster and easier. 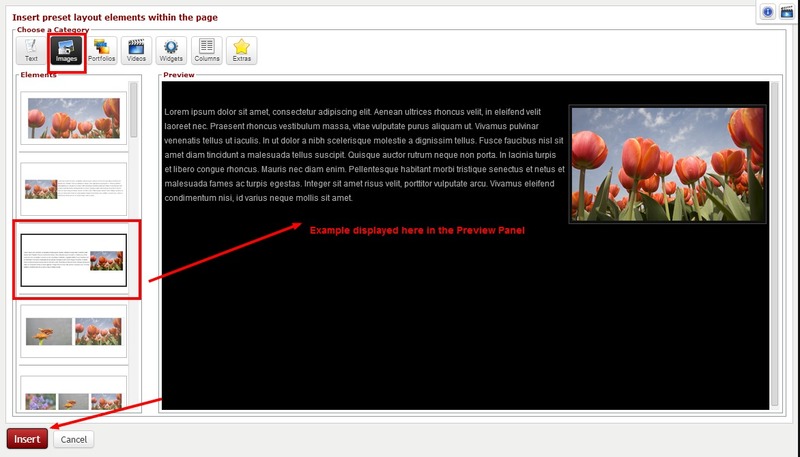 Page Elements provide you with pre-set areas for images, video, text etc. You simply need to replace the image and/or text ‘place holders’ we provide with your own. Page Elements differ from Page Layouts in that they contain fewer elements. 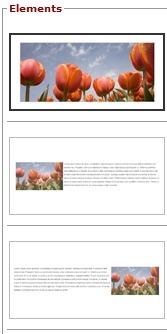 For example a page layout may include 6-8 images and 3-4 different areas for text. A page element is much smaller, containing only a single picture or two and fewer text boxes. Page elements can be combined with other page elements to build the ‘perfect’ page for your site. The example to the left is of a few Page Elements – Images you can insert into a page. See and choose an element from the Choose a Category drop down list. Then you can see available options in the Elements area. Clicking one of the smaller thumbnails will display a larger version in the “Preview” panel, and the displayed element will have a black highlight line around it. When you have chosen the Element you want to place on your page, click the Insert button After clicking Insert, you will be returned to the Page Editor where you can replace the demo text and image with your own. NOTE : You can also access the Page Editor for any page via ‘Manage Your Pages’ in the drop down Menu under ‘Manage’. Open the Page Editor by clicking edit for any given page, and the Page Editor will open for that page.